If you own a comic book shop, bookstore or even a novelty type store and are interested in carrying my book(s) for the upcoming Holiday season.... e-mail me: Rickgoldsc@aol.com I can work a very nice deal for you on large or small quantities of the hardback edition of THE MAKING OF THE RANKIN/BASS HOLIDAY CLASSIC: RUDOLPH THE RED-NOSED REINDEER (Miser Bros Press) which is starting to wind down it's print run. If you would like to buy autographed copies direct (with drawing and dedication), you can also e-mail me. I want to THANK Tim AIM: MUMMRA 666 for passing along the info that JULES BASS and PETER BAKALIAN were looking for on Ted Wolf's Daughter! 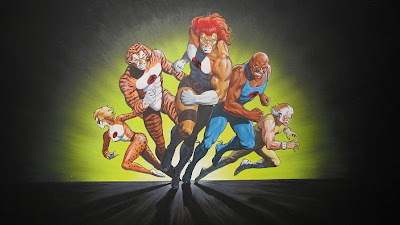 He also passed along this early concept art from THUNDERCATS! 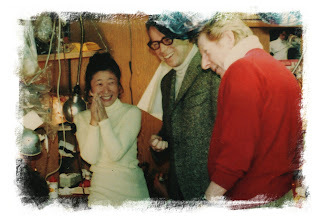 KYOKO KITA, ARTHUR RANKIN, JR. and DANNY KAYE at MOM Studios 1972! If you don't have this DVD in your RANKIN/BASS collection...get it soon! The actual title of this special is THE ENCHANTED WORLD OF DANNY KAYE: THE EMPEROR'S NEW CLOTHES but CLASSIC MEDIA was afraid of being sued by the KAYE estate, so they didn't use the title or the familiar ANIMAGIC image of DANNY on the cover....hence the poor sales. This DVD has a GREAT 8 minute original documentary film made by RANKIN/BASS to promote the series THE ENCHANTED WORLD OF DANNY KAYE and features both ARTHUR and JULES directing Danny, working in the MOM studio at the puppet set and some incredible JACK DAVIS Production art! It also features MAURY LAWS conducting in the studio with DANNY and ALLEN SWIFT. Some AMAZING stuff! The special is also RARE and looks amazing as well!